Choosing the Right Nozzle | Gonneville Inc. Choosing the right nozzle is the key to achieving maximum productivity with whatever air compressor you have available to you. Choose a nozzle with too small of a bore and you’ll be leaving some blasting capacity on the table. Choose a nozzle with too big of a bore and you’ll lack the pressure to blast productively. There’s a balance to be struck, and it starts with your air compressor. High pressure increases the velocity of the abrasive particles, delivering more kinetic energy upon impact, imparting a deeper anchor pattern. This allows you to use a finer grade of abrasive, which produces more impacts per volume. More air capacity lets you use a bigger bore nozzle, which allows you to put more abrasive on target. Assuming that the air compressor capacity available to you is not unlimited, you’ll need to select a nozzle with an orifice small enough to maintain a productive air pressure at whatever volume your compressor can supply. For vapor abrasive blasting, the most commonly-used nozzle orifice sizes ranges from 3/8” inner diameter to 3/4”, increasing by increments of 1/16”. A 3/8” nozzle is sufficiently constricted to produce a effective blast pressure with a 185 CFM compressor. A ½” nozzle is sufficient to produce an effective blast pressure with a 375 CFM compressor. It’s important to note that when you double the diameter of the orifice, you quadruple the size of the orifice and the volume of air and abrasive that can pass through the nozzle. To find your optimally productive nozzle, determine what nozzle pressure (PSI) you need to maintain for productive blasting, and what volume of air your available compressor can supply per minute (CFM), then consult the following chart to find the nozzle orifice size that meets those parameters. Bear in mind that your compressor will produce less pressure at the nozzle than what is indicated on the chart, depending on the condition and configuration of your equipment. Nozzles wear out. Abrasive passing through the nozzle will wear away the lining, enlarging the orifice. A worn nozzle requires more volume per minute to maintain your target pressure. For example, If you bought a #8 (1/2″) nozzle to get 100 PSI with your 375 CFM compressor, once it has worn out 1/8″ diameter to the next nozzle size up (#9 – 5/8″), you’d be lucky to maintain 65 PSI using the same compressor (on the #9 line, the 375 CFM compressor falls between 350 and 400 CFM, so you can only maintain 65 PSI), because the volume of air passing through the enlarged orifice would be inadequate to maintain the pressure. However, if you purchased a #7 (7/16″), still using a 375 compressor and targeting 100 PSI, once it had worn out to the next size up (#8 – 1/2″), you’d still be able to achieve 100 PSI, but you’d sacrifice some productivity earlier in the nozzle’s life (compared to a #8 (1/2″) nozzle) because the amount of air and abrasive that could pass through the orifice at 100 PSI would be less than what your compressor could supply. Pressure can drop significantly between the compressor and the nozzle, up to one PSI per 50’ of hose (1” I.D.). In addition, pressure will drop with each bend in the hose or change of direction: the shortest, straightest hose configuration is best. On top of that, if there are ill-fitting couplings or leaks in the hose, the pressure drop could be total. Not only does the size of the nozzle bore effect volume and pressure, but it effects the size of the blast pattern. For each nozzle size increase, expect up to a 10% increase in the size of your blast pattern. But it’s the shape of the nozzle, rather than orifice size, that has the most impact on the size of your blast pattern. As compressed air enters the converging end of a straight bore nozzle it accelerates, accelerating the abrasive particles suspended in the flow. The particles exit the nozzle in a tight stream and produce a narrow, concentrated blast pattern upon impact. Straight bore nozzles are commonly used in blast cabinets and for spot blasting, weld-shaping and other intricate work, but are poorly suited for blasting large surfaces. Venturi nozzles feature a converging entry, and a diverging exit. This shape is designed to produce an effect which greatly accelerates the air flow and particles– it is not, however, the venturi effect. The venturi effect is an observation that when an air flow accelerates while passing through a constriction, there is a corresponding drop in pressure. This is not the key principle at work in a “venturi” nozzle. Technically, these nozzles are de Laval nozzles, the same design featured in jet exhausts. 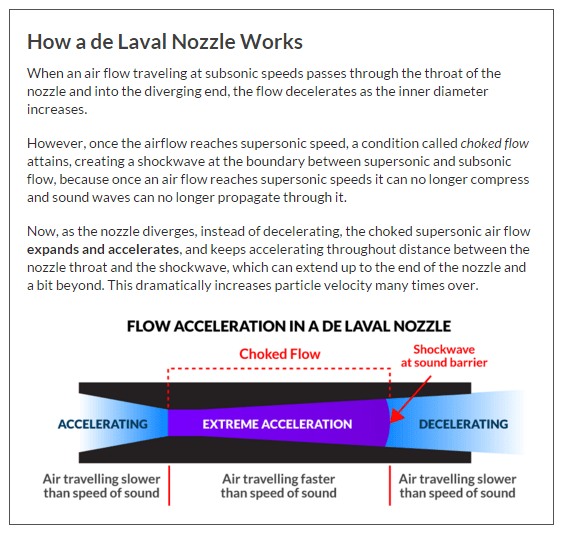 The rapid acceleration of the air flow and particles in a de Laval nozzle is due to an effect that occurs as the flow breaks the speed of sound. Besides producing tremendous acceleration, the angled shape of the diverging end spreads out the flow, producing a large blast pattern and a more uniform particle distribution than a standard bore nozzle. Long venturi nozzles produce up to 40% better production rates and consume less abrasive compared to straight bore nozzles. A double venturi nozzle is a de Laval nozzle with an extra wide exit opening and holes at the diverging end. According to the venturi effect, as the velocity of a flow increases, the pressure drops, creating a vaccuum between the shockwave and the throat, reducing abrasive velocity. With a double venturi nozzle, atmospheric air is drawn through the holes into low pressure area, expanding the air flow to produce a wider blast pattern. These extra-long nozzles accelerate particles over a longer distance, achieving higher exit velocities, allowing the blaster to stand further back from the surface being blasted, and producing a larger blast pattern and higher production rates. Wide throat nozzles are de Laval nozzles with a wide throat and an extra-1/4” wide converging section. When used in conjunction with a hose with matching inside diameter (and with a corresponding air volume increase), the wide throat nozzle can enhance productivity up to 15% over long venturi. The third consideration when choosing a nozzle is the composition of the lining inside the bore. 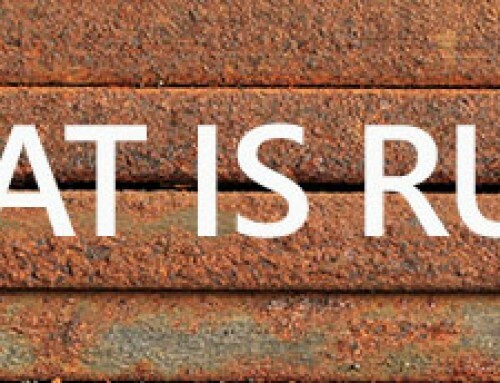 Harder materials will be more resistant to wear, but are more expensive to replace and are prone to cracking under rough handling. There are four basic types of carbide nozzles. Tungsten Carbide: This is the least durable of the carbide nozzles, but relatively cheap and resistant to impact. Suitable for blasting slag, glass and mineral abrasives. 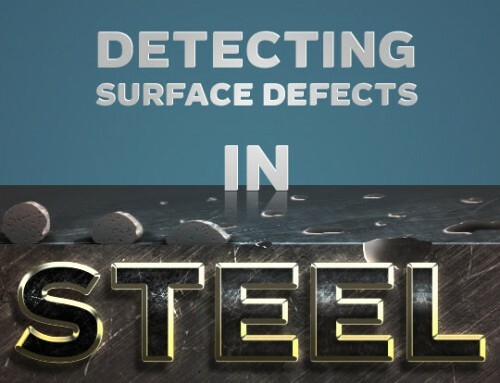 Silicon carbide: Impact resistant and durable like tungsten carbide, but lighter. Causes less operator strain. Boron Carbide: Extremely hard and durable, but brittle. Up to ten times the longevity of tungsten carbide. Composite Carbide: Some manufacturers produce their own composite carbide nozzles, which are even harder than boron carbide. Nozzles are not cheap to replace. One benefit of vapor abrasive blasting is that your nozzles will last up to 3x longer than a dry blasting nozzle, because the particles are enclosed in a lubricating water jacket, which reduces friction between the abrasive and the nozzle lining. Another important benefit is that the vapor abrasive blaster has fine control over his abrasive feeding rate. With sandblasting, it’s more difficult to adjust, with a lesser range. Moving up from a #6 to a #8 nozzle with a sandblasting rig will almost double the amount of abrasive consumed. Research has shown that blasting productivity gradually increases with abrasive feeding rate until a critical value is reached, after which productivity maintains constant. So after that value has been surpassed, consuming more media actually reduces particle velocity, wastes abrasive and lowers efficiency. Because the vapor abrasive blaster can easily adjust his abrasive flow rate to find that critical value, he can achieve optimal productivity at lower pressures than dry blasting. Whereas a sandblaster using 375 CFM compressor and #8 nozzle at 110 psi will consume 650-750lbs/hr of sand, a vapor abrasive blaster with the same compressor and nozzle can get a similar production rate at a lower pressure, while consuming only 150-175 lbs.hr. Big air and big nozzles lead to big production rates, but it’s the shape of the nozzle bore that determines the acceleration of the particles and the size of the blast pattern. To maximize your productivity, choose the biggest nozzle bore that your compressor will support at a pressure that will be productive, given the surface characteristics and specifications of the task, while taking into account that there will be a significant reduction in pressure as your nozzle wears to a larger diameter. Finding the sweet spot where your nozzle can be productive over its useful life span is key to getting the most value out of your nozzle.